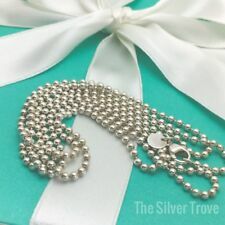 Please Return To Tiffany & Co Sterling Silver Oval Tag Choker Necklace 15.5"
Ending 28 Apr at 13:39 EDT4d 7hMetal: Sterling SilverBrand: Tiffany & Co. Authentic Tiffany & Co Sterling silver 1837 small Interlocking Circles Pendant necklace. Proudly inscribed with the year Tiffany was founded, the Tiffany 1837 collection nisndwfined by sleek curves and contours. A duo.of Interlocking Circles adds a modern touch to any look. 16" long chain. Each circle is 1/2" in diameter.. Plaque next to clasp is marked "Tiffany & Co 925". Comes with its genuine Tiffany box and storage pouch. Excellent condition. Recently polished. Original retail is $300. New ListingReturn to Tiffany & Co. Heart & Key Tag Pendant Chain Necklace 925 Silver 18"
From United StatesMetal: Sterling SilverBrand: Tiffany & Co.
New ListingTiffany & Co Silver Paloma Picasso Villa Flower Pendant Necklace with Box Mint! AUTHENTIC TIFFANY & CO. PALOMA PICASSO VILLA FLOWER PENDANT NECKLACE. Hallmarks: T & Co. AG 925 Paloma Picasso. Includes Tiffany box and white ribbon. Metal: Sterling SilverBrand: Tiffany & Co. Authentic Tiffany & Co. Sterling Silver Venetian Box Chain Bracelet 7.5" #M. No original box/papers. TIFFANY & CO STERLING SILVER VENETIAN BRACELET 7.5"
T I F A N Y & C O sterling silver venetian chain bracelet. Marked: Tiffany & Co. Condition: Very good, normal wear, NO Tiffany`s blue pouch. Tiffany & Co. Gently worn, light signs of wear, needs to be polished. Continuous Star Link Bracelet. Hallmarked T & Co. 925. Material : 925 Sterling Silver. Surface Scratches. Clasp Does Not Spring Tightly Closed and Needs To Be Pushed Closed, Needs Repair. Closure : Lobster Clasp. Color : Silver. Trending at C $116.99eBay determines this price through a machine-learned model of the product's sale prices within the last 90 days. Authentic Tiffany & Co. Mini Pendant Charm. Sterling Silver. About 1/2" or 11mm tall. 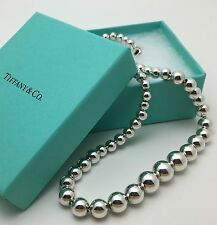 Tiffany & Co. Sterling Mini Round Bead Bracelet. Authentic Tiffany & Co Sterling silver Eternity Pendant on a double chain. 16" long. Plaque next to clasp is marked "Tiffany & Co 925". Comes with its storage pouch. Hallmarks: Tiffany & Co. 925. We will do everything within our power to make your wowsilver experience a positive one. Very Good Condition Bar Pendant Tiffany @ Co Sterling Silver,With Box. Tiffany and Co Sterling Silver .925 Toggle Bracelet 5 chain links with hearts 8"
This is an unique Tiffany and CO bracelet that is made out of sterling silver. I haven't seen a design like this before. The bracelet is SOLID heavy at 111.3 grams. The piece was looked at / valued in the mounting. Rare Tiffany & Co Sterling Silver 925 Open Stencil Daisy Flower Charm Bracelet.. Condition is Pre-owned. Light scratches, could use polishing. Measures approximately 7". Includes pouch. Nice! This TIFFANY & Co Sterling Pendant is in good condition. Size - 23 x 23 mm. Hallmark - "© T. & CO. 925". Weight - 3.75 grams. For sale is anew and retired Tiffany and Co. Includes: Tiffany Gift Box, White ribbon, Blank Tiffany Gift Card. Hallmarks: ©Tiffany & Co.
DISCOUNT AVAILABLE Return to Tiffany Silver Circle Tag Charm Bracelet Chain 7"
A Tiffany classic in very nice preowned condition. Ending 30 Apr at 11:10 EDT6d 5hFrom United StatesMetal: Sterling SilverBrand: Tiffany & Co.
You are viewing a Tiffany & Co.
From the Tiffany site: “The simple, evocative shape of the Elsa Peretti Open Heart designs celebrate the spirit of love. This elegant style is one of her most celebrated icons”. Signed Elsa Peretti, Tiffany & Co..925, Spain on pendant and on the chain/clasp. Hallmarks: Tiffany & Co. 925. Clasp: Box. A Stunning Tiffany & Co. The bracelet is hallmarked: Tiffany & Co. 925. 3 Tiffany & Co.925 silver set weighting around the 27 gram mark all 3 pieces are marked Tiffany and look to be a set. 100% authentic Tiffany & Co. Hallmarks: "Tiffany & Co 925". Sterling Silver - Authentic. (from normal use). Tiffany & Co. Gross weight 54.6 grams. In very nice condition, enlarge photos for detail. WEIGHS 6.2 GRAMS. 3.5MM THICK. SIGNED TIFFANY & CO 925 ON BOTTOM. VERY GOOD PRE-OWNED CONDITION. PROBLEM FREE ITEM. GREAT VALUE HERE ! SOLD "AS IS". 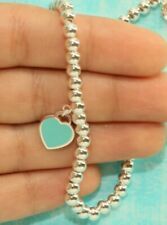 Tiffany & Co. Heart Keyhole Lock Charm Chain Bracelet, Sterling Silver, 7"
Tiffany & Co. ♡ Heart Keyhole Lock Charm Chain Bracelet ♡ 19-696-1. Series : Heart lock. This item ispre-owned. Other : Our original gift box included. Hallmarked : On the heart, "TIFFANY & CO.; 925.”. On the lobster claw "925". Tiffany & Co. Gently worn, light signs of wear, needs to be polished. Continuous Star Link Necklace. Hallmarked T & Co. 925. Marked: TIFFANY & CO. Style: Necklace. Chain Length: 16. It is 100% genuine item. Material: Silver 925. Ending 30 Apr at 11:56 EDT6d 6hFrom JapanMetal: Sterling SilverBrand: Tiffany & Co.
Tiffany & Co. Bean: L19mm x W12mm x T6mm. Thickness: 1.60mm. Tiffany & Co Silver Paloma Picasso Villa Flower Pendant Necklace with Box Mint!